Wow, we have had a busy few weeks at Badgers Sett Holiday Cottages! In mid-February the installation of Wood Burning Stoves in Lavender and Thyme Cottages commenced, the guys from South West Heating did a fantastic job despite having to drill through two foot thick walls to enable the outside flues to be put into place! We think the resulting stoves look amazing and will provide warmth and ambience all year round to both cottages. Thyme gained an unplanned new tiled floor too as a result of one of the radiators apparently not having worked for some years, we had the original floor dug up in order to unblock the central heating pipes buried underneath! The 'Owner' Neil, mused that he wanted to change the flooring when we first landed at Badgers - 'be careful what you wish for' I say ..... Rosemary Cottage has not missed out either, the original bathroom having been completely removed and now has a large walk-in shower with light, bright accessories, just the thing for our barn I am now thinking! March has seen Snowdrops and primroses starting to show their pretty heads above the ground in the Badgers garden and local lanes when suddenly 'The White Stuff' decided to make a visit, along with The Beast from the East and Jack Frost .... very pretty it was too and 'Frosty the Snowman' made an appearance in the garden, however, when pipes started to freeze and no water came out of the taps we decided it was time for them to return to Siberia pronto! With the Easter Holidays now almost upon us, the cottages are 'all spruced up' and ready for guests to come and stay! Many of the local attractions are now open, with lots of beautiful Spring Gardens to amble round and Easter Egg hunts for the children to enjoy. With this in mind, we have a Special Offer of a 10% discount on the price currently listed on our Website for bookings taking place between 31st March and 7th April 2018. A delicious home-made Cornish Cream Tea (#Jam first of course) will be waiting for Guests on arrival. 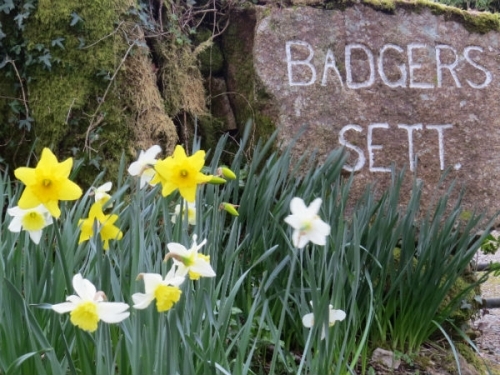 Why not take a look at our 'Availability & Prices' page and treat yourself to a relaxing Easter Break away from it all at the lovely Badgers Sett Holiday Cottages! Until next time, have a wonderful Easter and enjoy all those delicious hot cross buns! Lost Gardens of Heligan in the Springtime Sunshine !